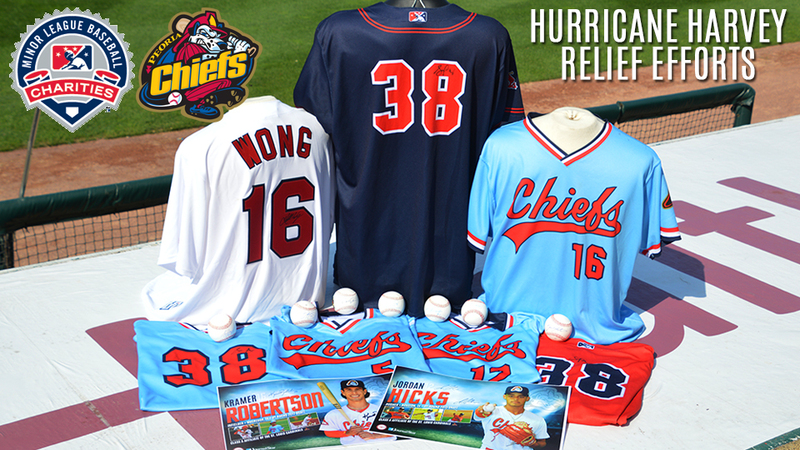 PEORIA, IL - The Peoria Chiefs are partnering with Minor League Baseball Charities to raise funds for Hurricane Harvey relief efforts. The Chiefs will hold a Mystery Ball & Bobblehead Grab Bag at Friday's regular season finale with all proceeds going to the Hurricane Harvey relief efforts and the team will also hold an online auctionof game-used items and other memorabilia over the next week. MiLB Charities announced Thursday that they will match each Minor League Baseball team's contributions to the fund, up to $10,000. Fans attending Friday's fan appreciation night game at 6:30 against Quad Cities can purchase a mystery ball for $20. Every ball in the grab bag is autographed by a Major or Minor League player or by former Major Leaguers. Teams from around Minor League and Major League Baseball made donations to the Mystery Ball Grab Bag throughout the season. Fans could walk away with baseballs signed by: Kyle Schwarber, Mookie Betts, Rollie Fingers, Kolten Wong, Stephen Piscotty, Willie McGee, Lee Smith and team signed balls from various Minor League teams. Among the bobbleheads are Derek Jeter, Willie Stargell, Mariano Rivera, Lucas Giolito and a New York Yankees Hello Kitty bobblehead. The online auction will run through Friday, September 8 at Noon Central and all proceeds will be donated to the MiLB Charities Hurricane Harvey relief efforts. Among the items up for online auction are: Stephen Piscotty's game-worn and autographed Sunday Chiefs throwback jersey and navy blue road jersey from his 2017 rehab appearance, Kolten Wong signed replica Chiefs jersey (not game-worn), Kramer Robertson's game-worn 2017 Sunday Chiefs jersey, Dylan Carlson's game-worn Sunday Chiefs jersey, Houston native Jordan Hicks' game-worn 2017 Sunday Chiefs jersey, MWL baseballs signed by former Chiefs pitcher Greg Maddux, MWL baseball signed by Kramer Robertson and 2017 Chiefs posters signed by Kramer Robertson and Jordan Hicks. All funds raised by the Chiefs and other Minor League teams will go to MiLB Charities and then sent to organizations selected by MiLB to help those impacted by Hurricane Harvey.